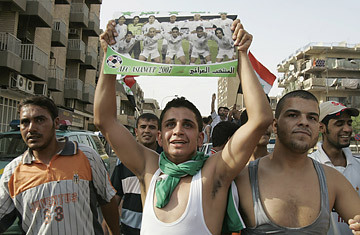 Men display a picture of Iraq's soccer players as they celebrate the victory of Iraq's soccer team over South Korea during the semi-final of the 2007 AFC Asian Cup soccer tournament. Forget the "benchmarks" that Baghdad's politicians are showing little inclination to meet; the best hope in recent memory for national reconciliation in Iraq came Wednesday in the form of a shootout  not your conventional sectarian or insurgent affair, but a series of penalty kicks that settled an Asian cup soccer semifinal in Iraq's favor. Iraq's upset victory over highly rated South Korea has earned it a showdown on Sunday against  boy, do the gods of soccer ever have a wicked sense of humor  Saudi Arabia. The news drew tens of thousands of Iraqis of all stripes out onto the street in a joyous celebration, which was tempered by two suicide bombings that killed more than 50 fans. Iraq's goalkeeper Noor Sabri, who made the vital save that allowed his countrymen to prevail 4-3, recognized the significance of the team's triumph: "You know the situation of the difficulties in Iraq," he told the Associated Press after the game. "What we can achieve inside the field, it's a modest thing we can give to our people. We have to show them we are sharing with them the celebrations." Just as Iraq's team includes Shi'ites, Sunnis and Kurds, so did the victory celebration span all of Iraq's divisions. Not only were Shi'ite and Sunni communities celebrating with equal intensity in the capital, many had risked life and limb to watch the game together with old soccer pals from opposite sects. For Shi'ite education ministry employee Abdul-Rahman Abdul-Hassan, 40, the tournament had prompted a reunion with three Sunni friends and former teammates he hadn't seen in two years because sectarian violence had forced them into different neighborhoods. "None of our politicians could bring us under this flag like our national football team did," he told The Scotsman. "I wish that politicians could take a lesson from our team, which is made up of Sunnis, Shi'ites and Kurds who worked together regardless of their backgrounds and won." Similar tales were reported from all over the city. And the Iraqi flag was even waved by celebrating crowds in independence-minded Kurdistan, where its display is officially discouraged. The soccer fans' passionate embrace  at least for a night  of a single Iraqi identity ought to have done more to reassure anxious U.S. policymakers than endless declarations of intent by the politicians in Baghdad. The game has a long history of helping bring a halt, although often just temporary, to civil hostilities. In 1967, a visit by Pele and his Brazilian Santos team to play exhibition matches in Nigeria brought a two-day cease-fire in that country's civil war. More recently, Ivory Coast's heroic exploits at the World Cup and African Cup of Nations have helped promote the peace process that has brought that country's civil war to a close. Then again, soccer has also been known to reinforce conflicts  a brief war between El Salvador and Honduras in 1969 was triggered by events at a soccer match between the two countries, while Croatian nationalists still mark the start of their war with Serbia not from the day the first shots were fired, but from a violent confrontation at a May 1990 match between the Croatia-based Dinamo Zagreb and Serbia's Red Star Belgrade. Some soccer writers still lament what might have become the greatest European team of the 1990s had Yugoslavia not broken apart. But Yugoslavia did break apart, and Iraq might also, despite the feelings expressed there on Wednesday. Soccer cannot bridge political divides that are based not simply on whether Sunnis, Shi'ites and Kurds can get along and pass the ball to one another, but on how power and control of territory and resources is to be arranged among them. As beautiful a moment as Iraq's shared celebration may have been, the danger remains that they're less akin to Ivory Coast's example of rapprochement than they are to the legendary Christmas 1914 soccer match on World War I's Western Front. That game, played between German and British soldiers in no man's land amid a remarkable unofficial yuletide truce, expressed the shared humanity among the combatants of both sides. And then they went back to slaughtering each other for another four years.